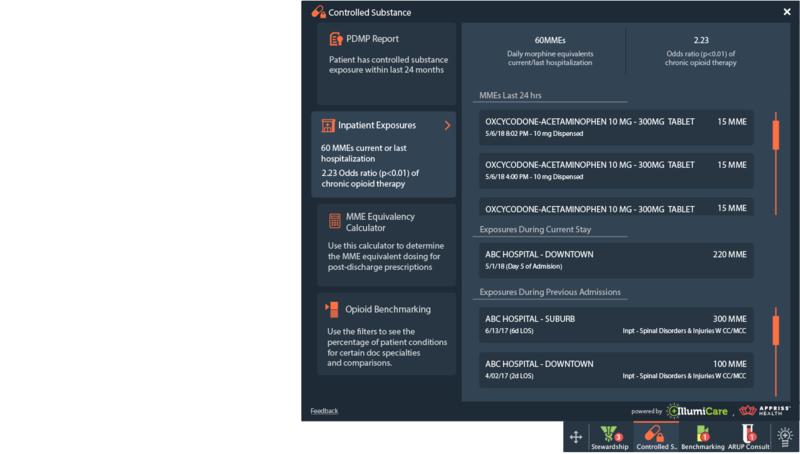 IllumiCare® empowers clinicians with real-time cost, opioid and critical data in focused views for expedited clinical decision making. Over-utilization is both harmful to patients and wastes limited healthcare resources. IllumiCare provides a non-intrusive Smart Ribbon® of information that is embedded within or floats over the EMR and gives providers real-time data within the physician workflow. As a result, providers order fewer and less expensive tests and medications. IllumiCare has been studied in both academic and community hospitals, comparing the behavior of providers with and without access to IllumiCare – of the same sub-specialties, in the same hospital and DRG-adjusted. Providers with IllumiCare, immediately after go-live, dropped their spend per admission by $170. The Smart Ribbon was designed by physicians for physicians. It unobtrusively presents actionable information, while putting the user in complete control of notifications. With an Up Vote / Down Vote, providers can curate their personalized interests or simply mute all. Our team has implemented technology solutions in more than 500 hospitals. We built IllumiCare to use existing HL7 feeds and existing user authentication methods. There is no EMR-integration required. IllumiCare is a service designed for us to do the heavy lifting, so that our customers get the benefit without the pain. 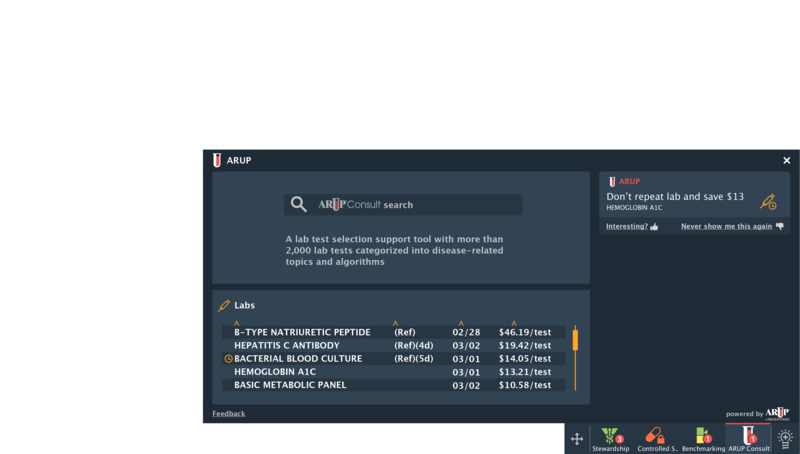 The same Smart Ribbon can be displayed for all user types and patient locations, or you can create multiple variants for different user type and/or patient location contexts. The first step is to determine the context in which each Smart Ribbon variant will display. Apps can include information produced by IllumiCare, third parties or the health system, and will range from $1-$10 per inpatient admission. 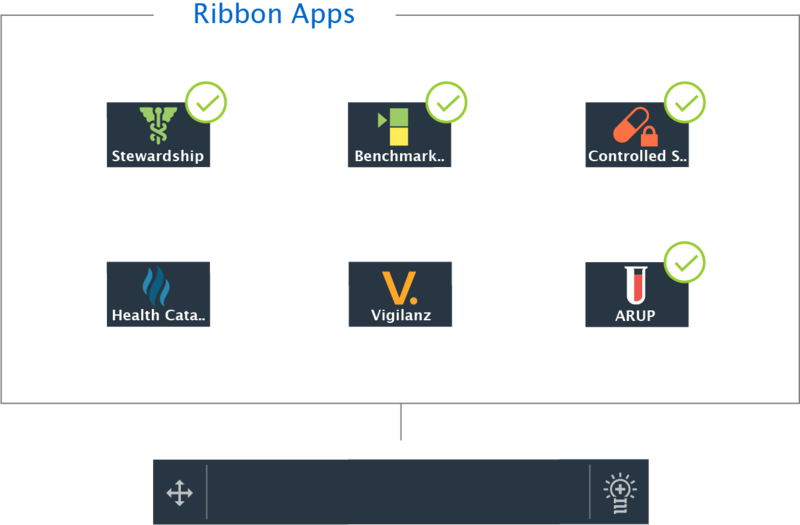 The second step is to decide which apps to include in each Smart Ribbon variant. Changing Smart Ribbons or adding new ones is just a configuration change and does not require a new/re-implementation. The last step is to publish the Smart Ribbon variant to the target population. Click through the tabs below to see how the apps will open from the Smart Ribbon. Customers and studies at both academic medical centers and community hospitals have shown that IllumiCare saves $170 per admission, a fraction of its cost. At IllumiCare we see every order for tests and medications. We know the ordering provider for every clinical order. And, we know the wholesale cost of every clinical order. This data allows us to accurately measure spend per provider (risk-adjusted) and track changes before and after go-live. But, U. Penn demonstrated that just showing a cost during the ordering process is not enough to change behavior. 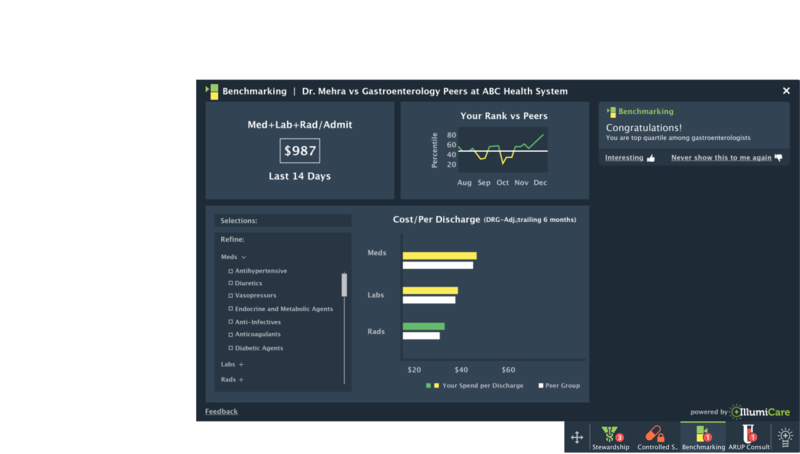 They found, “Price transparency interventions may need to be better targeted, framed, or combined with other approaches to be more successful.” By unobtrusively framing costs, running totals and benchmarking with iatrogenic risks and specific clinical insights, IllumiCare produces real results without adding to provider alert fatigue. 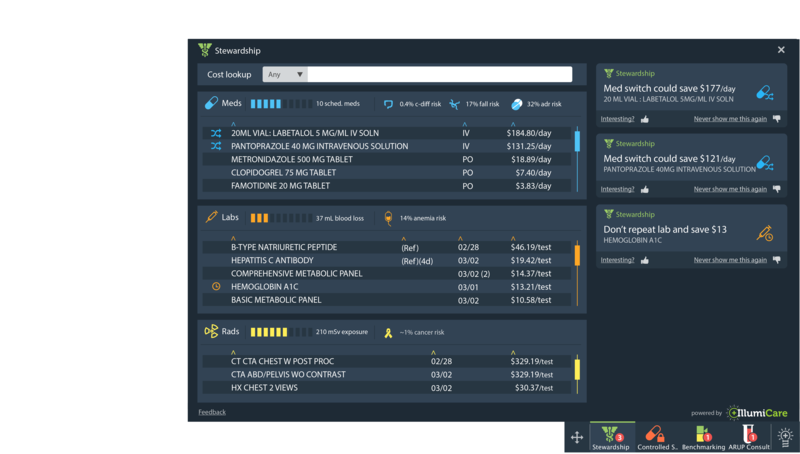 A Panoramic View Of Opioid Exposure"
the facilities access to healthcare cost data via the EHR system. If you work at a hospital/health system, what is your title? 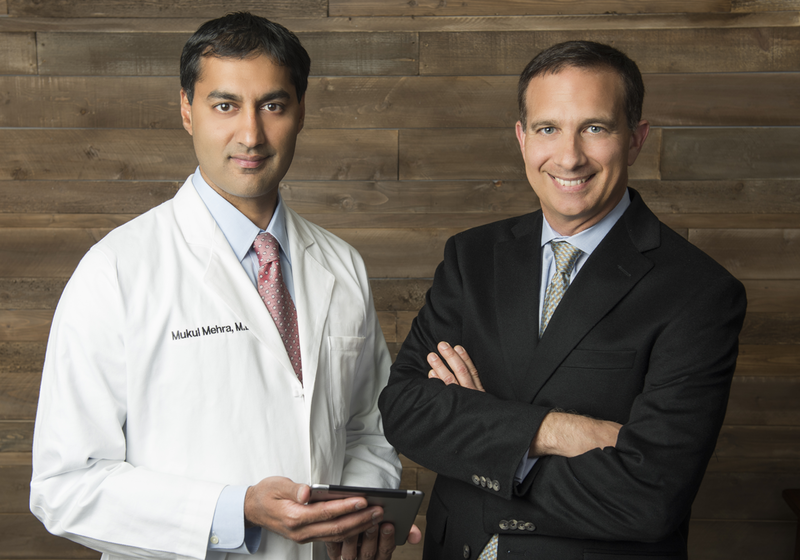 IllumiCare was founded in 2014 by a visionary physician and a team behind him with a combined 106 years of start-up / high growth company experience, almost all of which in healthcare IT. The team has either founded or played key roles in multiple venture-backed companies, which went public or were acquired. With deep experience in the clinical, financial and technical aspects of hospital operation, the group has the perfect background to create the Smart Ribbon, which combines actionable clinical and financial intelligence within a system that has a very light technical footprint. – IllumiCare is located in Birmingham, AL. There is so much more for us to share. Please let us answer your questions and provide you with more detail about how IllumiCare can help your organization. If you would like to talk more about what we could do for you, please call at 205-578-1738 or fill out our contact form.